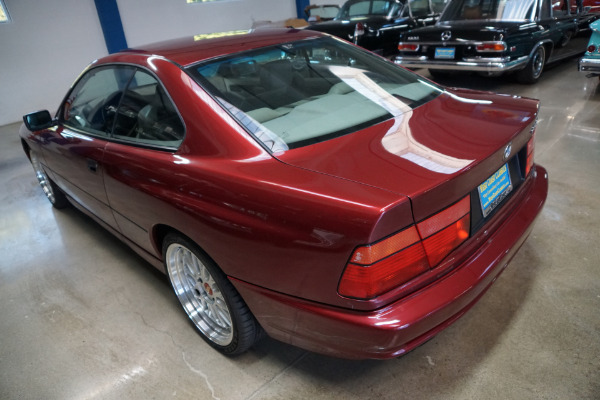 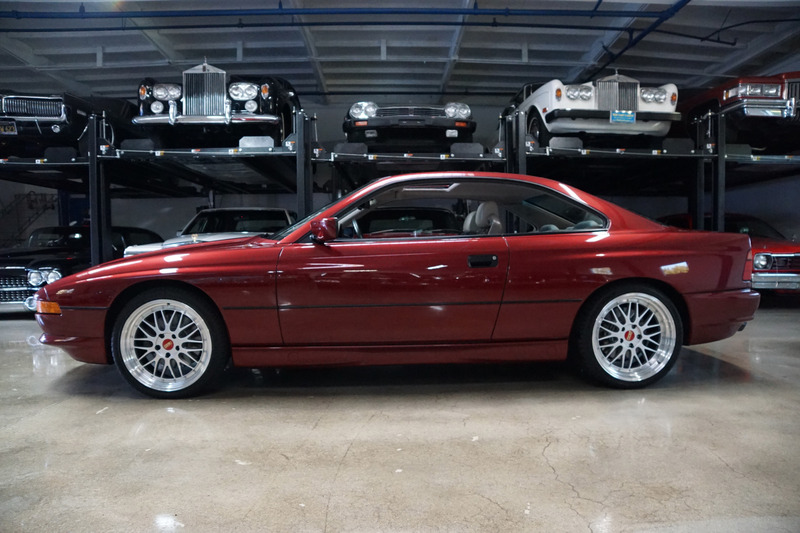 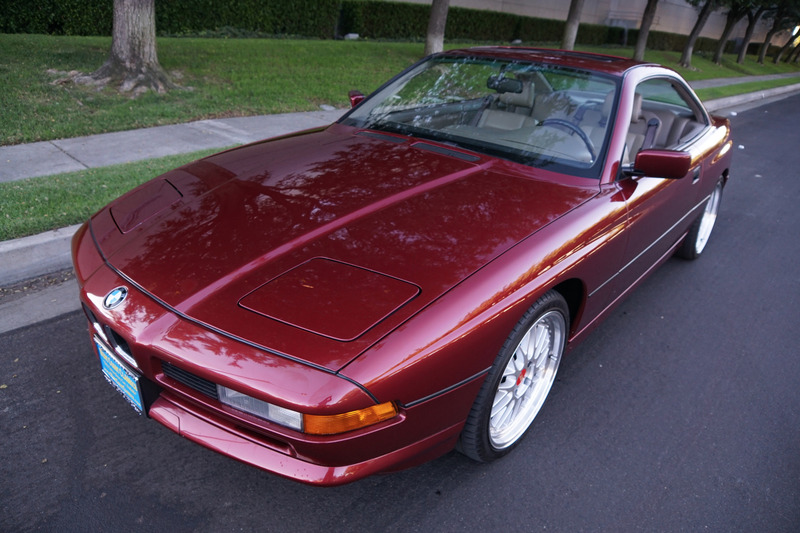 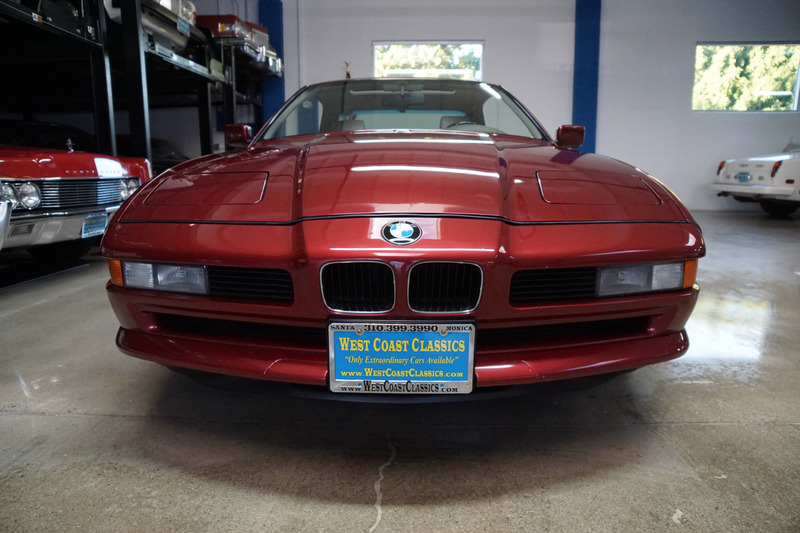 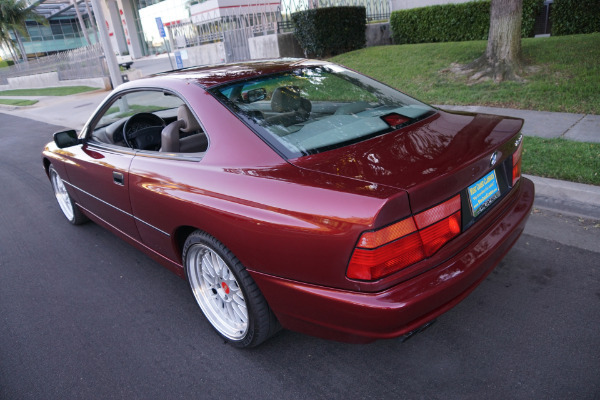 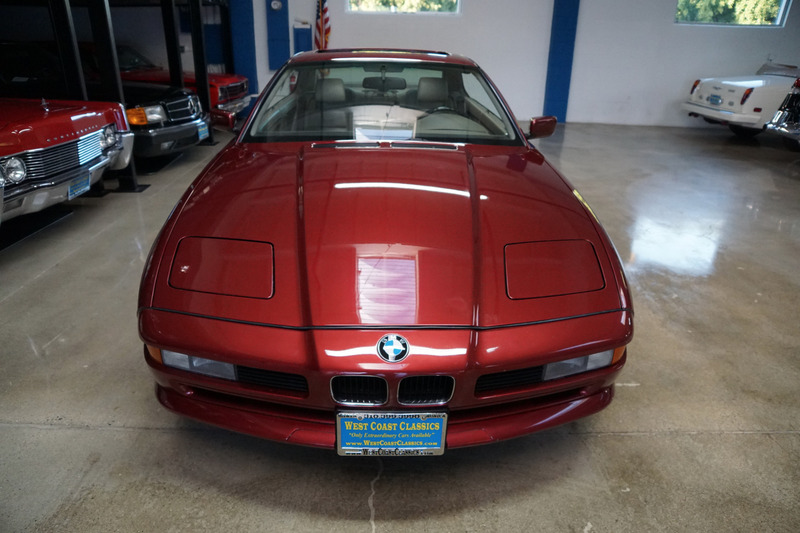 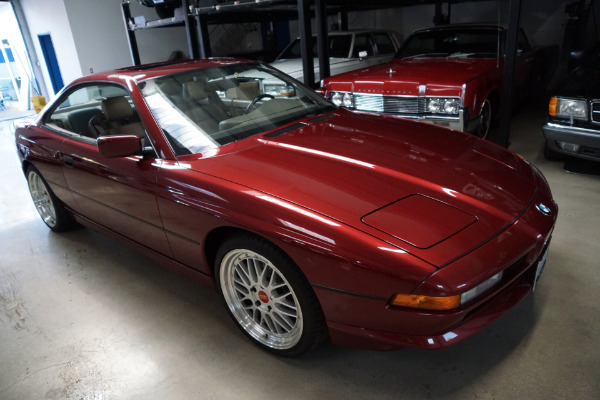 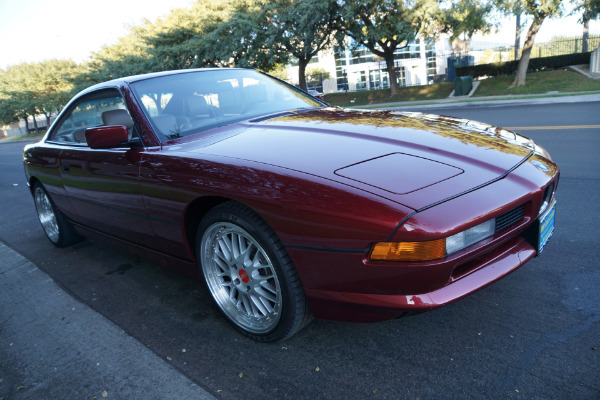 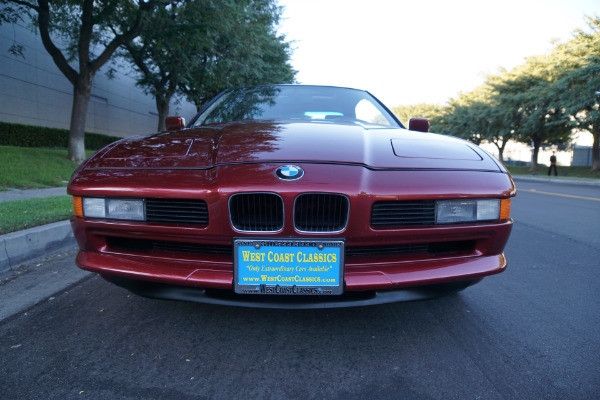 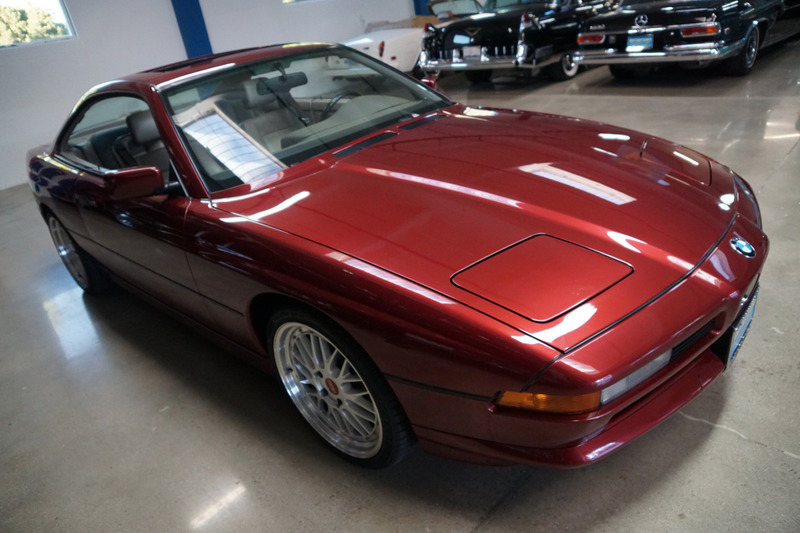 West Coast Classics are proud to present an absolutely exceptional example of this 1991 BMW 850i V12 2 Door Coupe; an obviouWest Coast Classics are proud to present an absolutely exceptional example of this 1991 BMW 850i V12 2 Door Sedan; an obviously always garaged example of the iconic 850 series, a rare modern day collectible BMW in rare and most desirable all original 'Calypso Red Metallic' color with a light Tan leather interior and only 55K original miles! 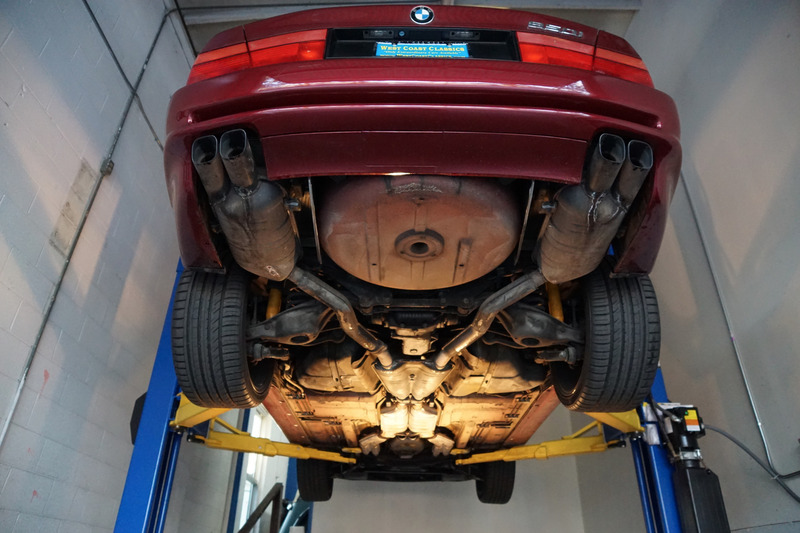 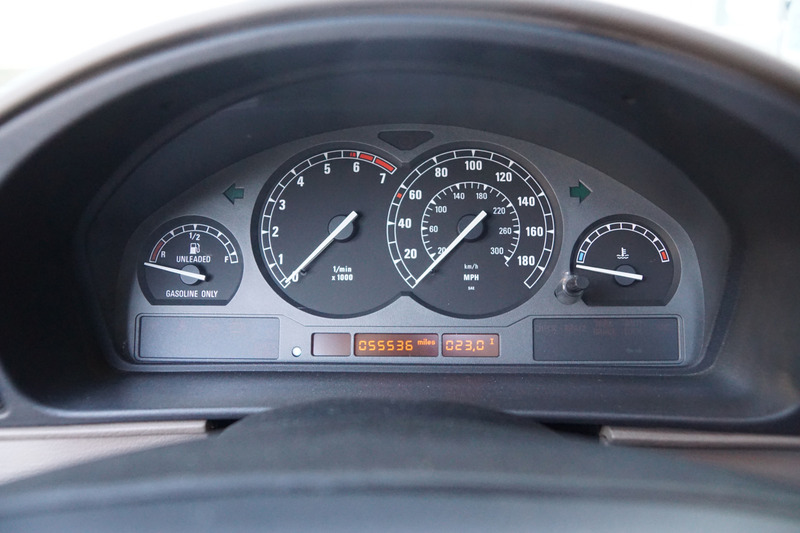 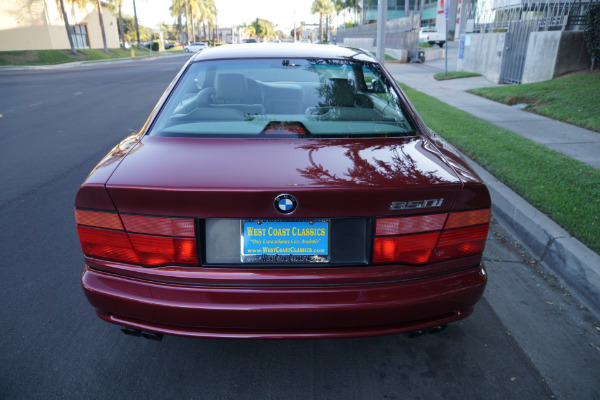 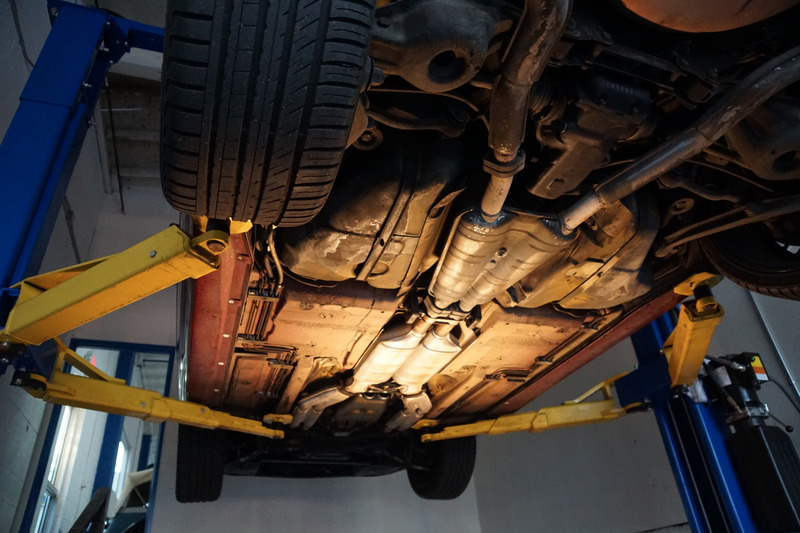 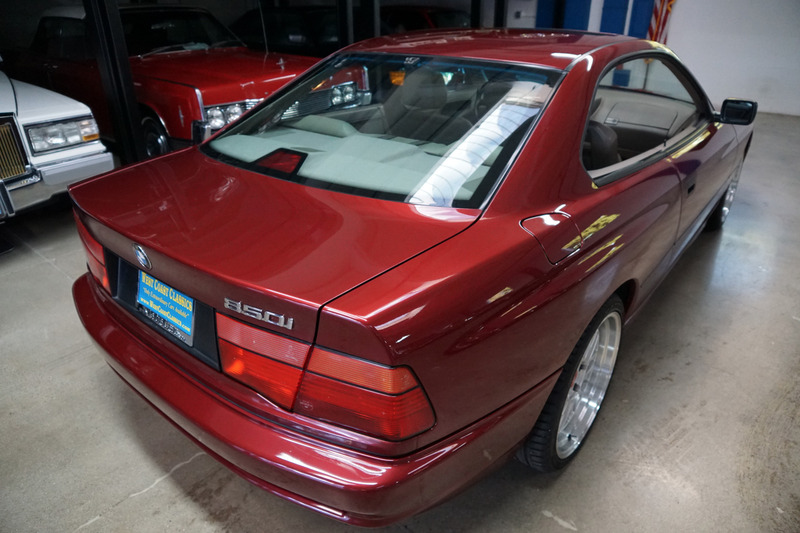 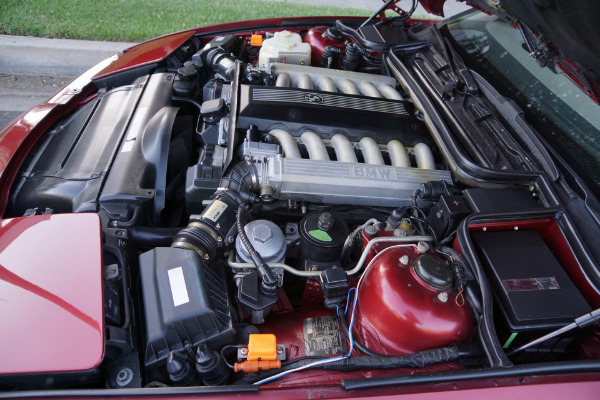 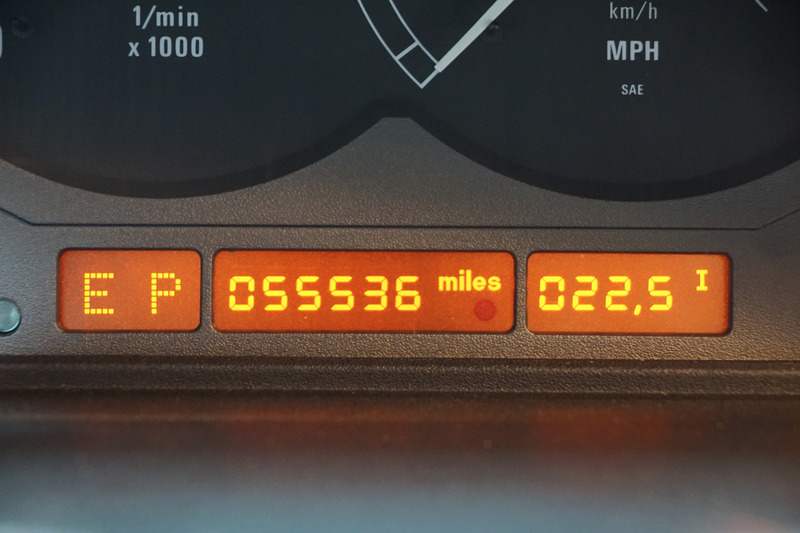 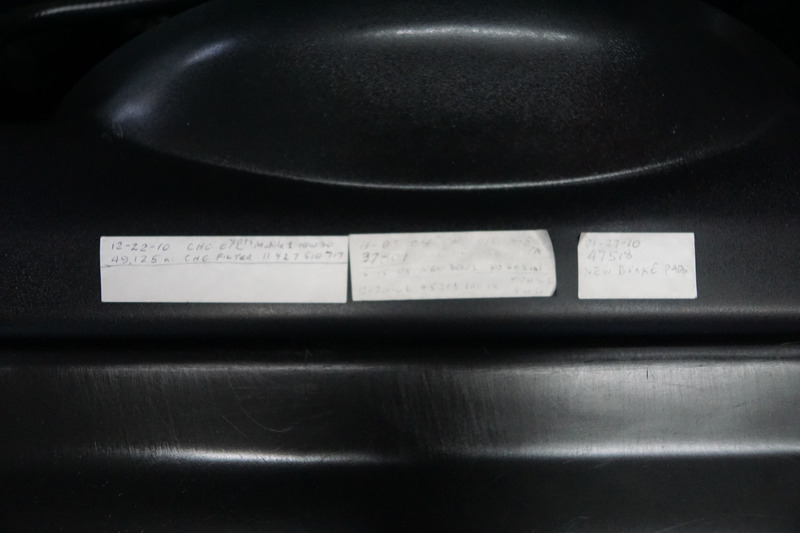 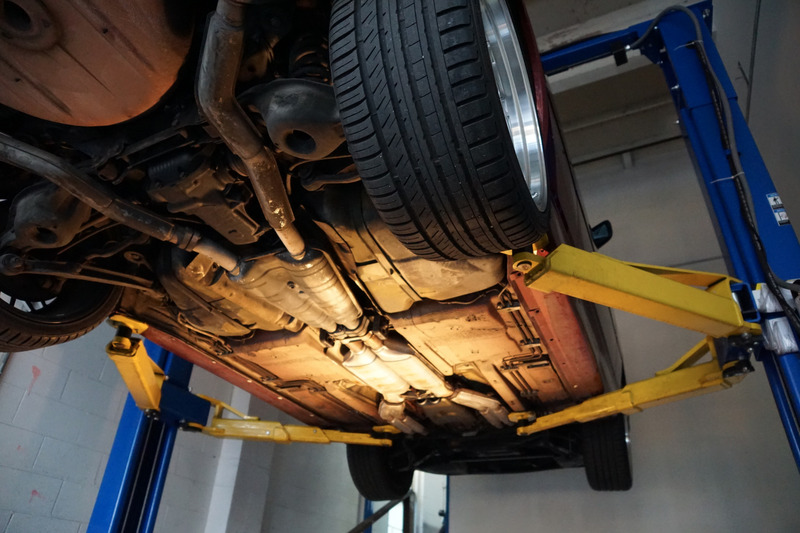 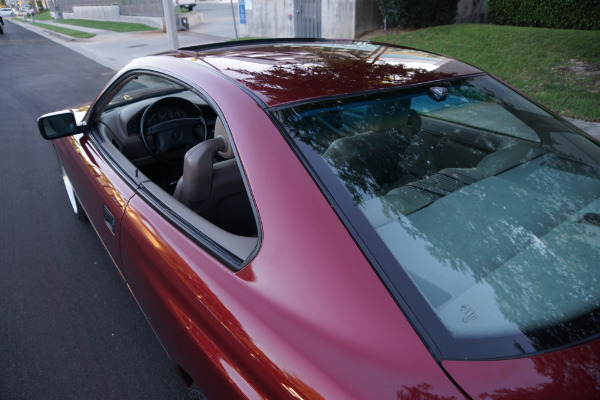 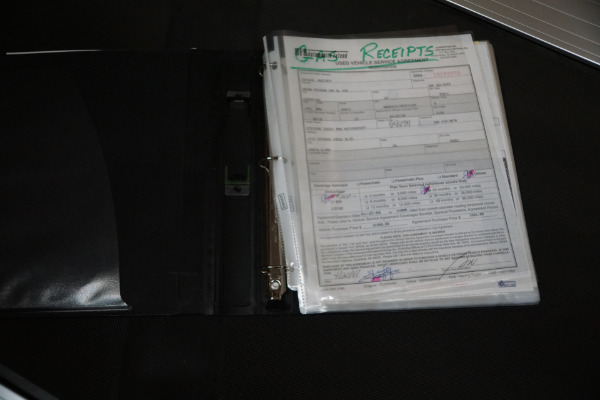 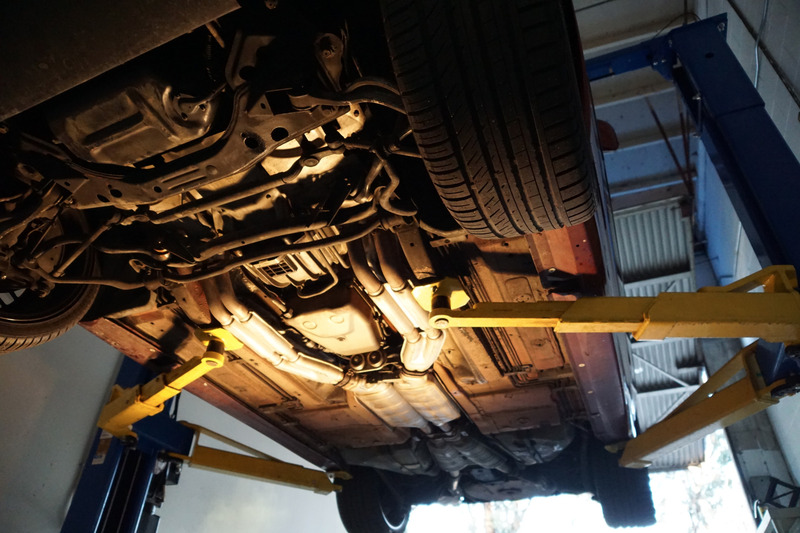 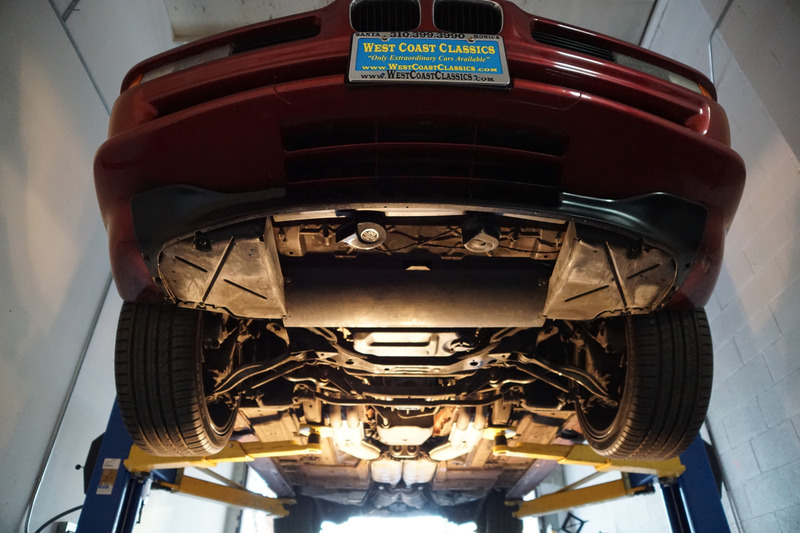 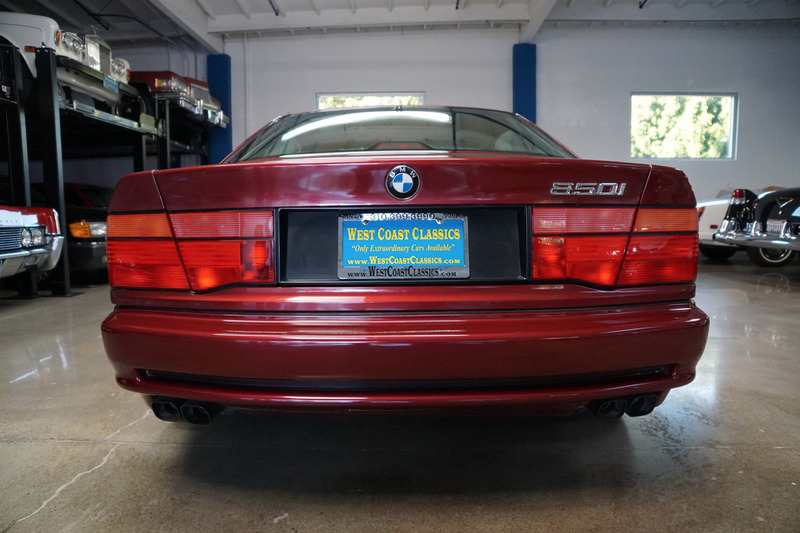 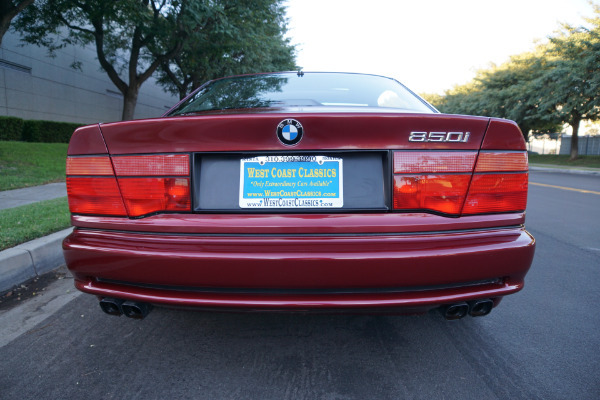 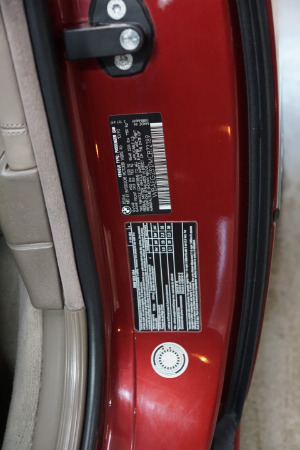 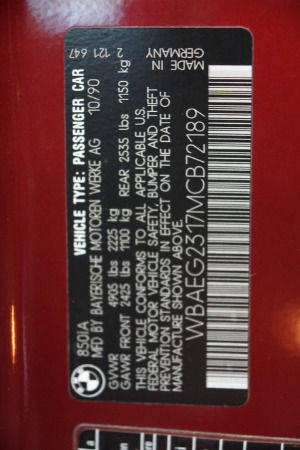 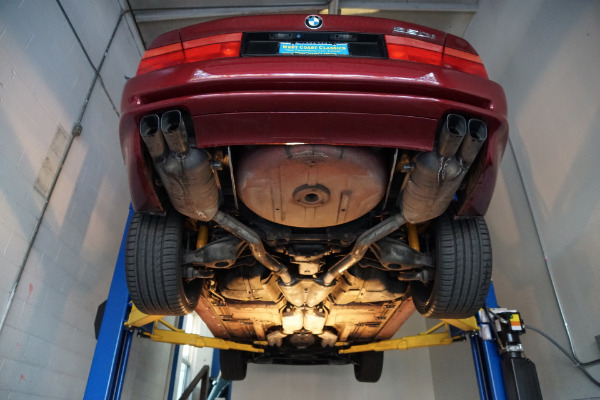 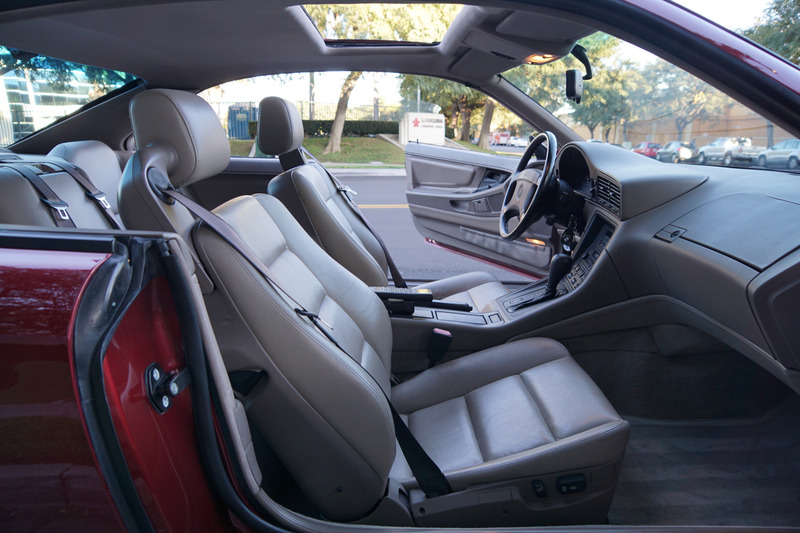 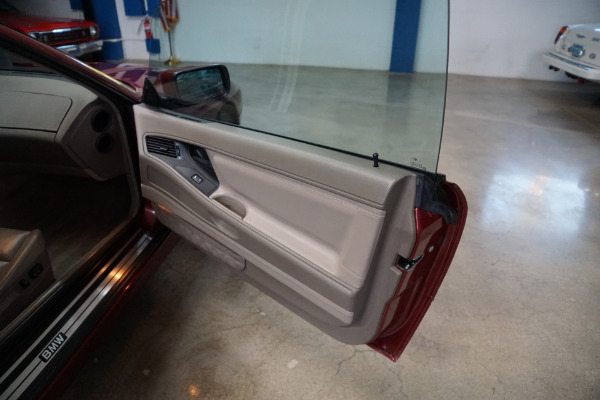 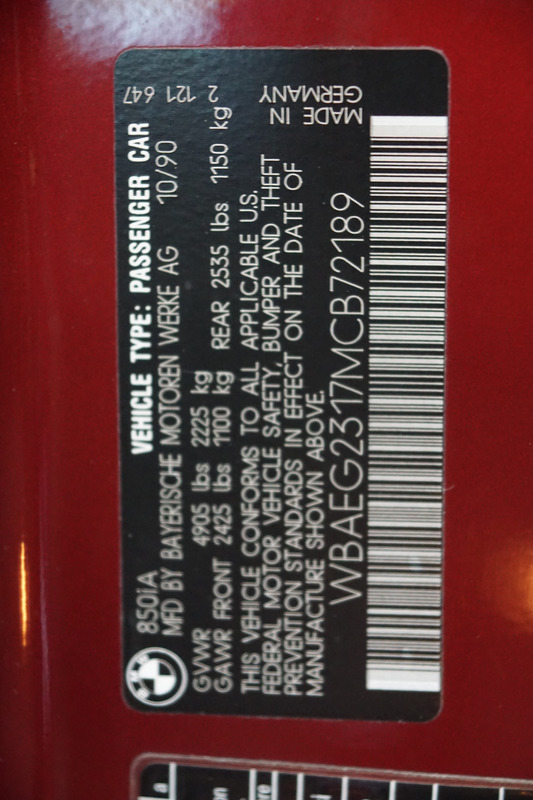 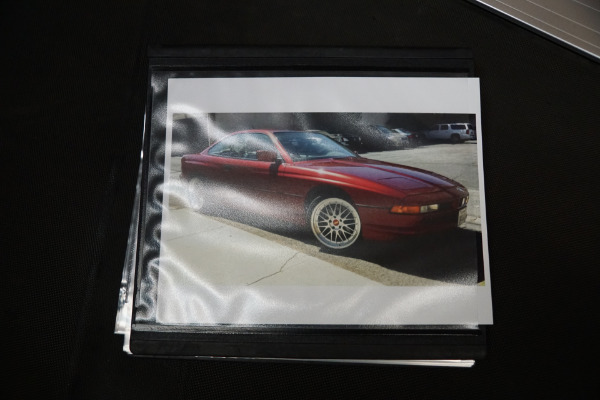 This particular car has been a southern California car since new with the car having been purchased in 1998 from 'Stevens Creek BMW Motorsport' of Santa Clara, CA with 30,710 original miles and where it has also been primarily maintained and serviced in recent years with a thick file of service records and history. 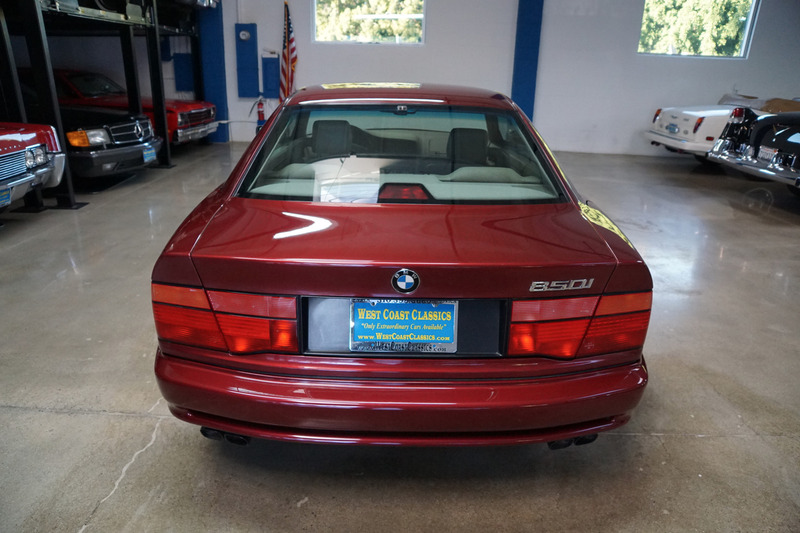 Finished in the original and beautiful factory color combination of 'Calypso Red Metallic' exterior paint with original tan leather interior with a clean CARFAX report! A truly obviously always babied and pampered example if there ever was one! The original paint is in absolutely beautiful condition and the tan leather interior is also in as beautiful condition with virtually no signs of any wear! 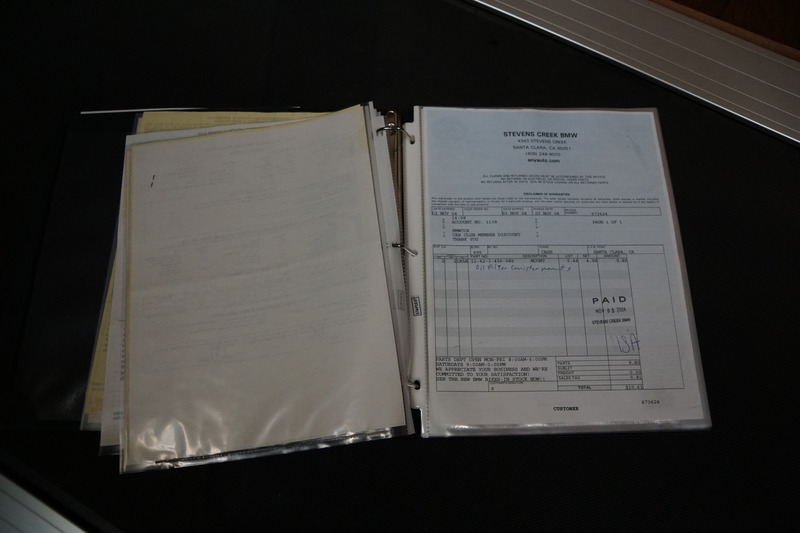 The rubber seals appear new and supple yet are all original. 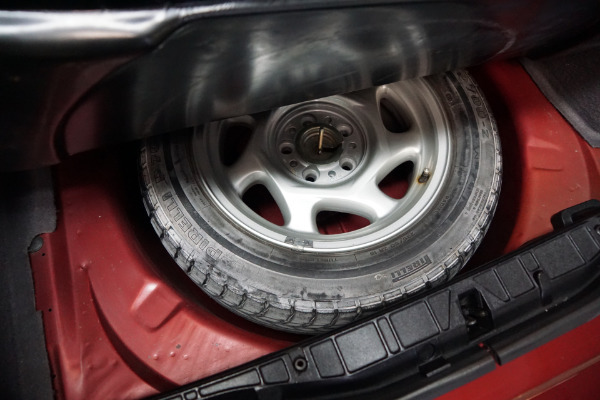 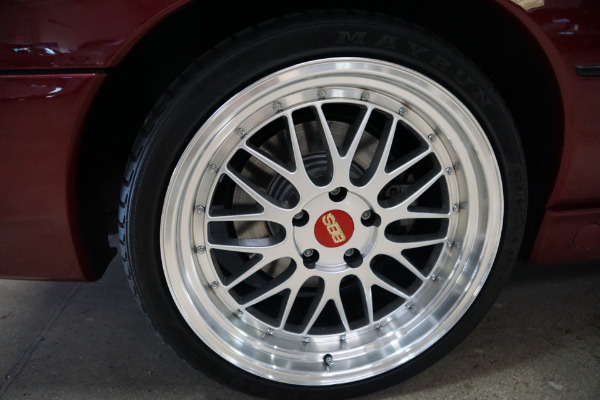 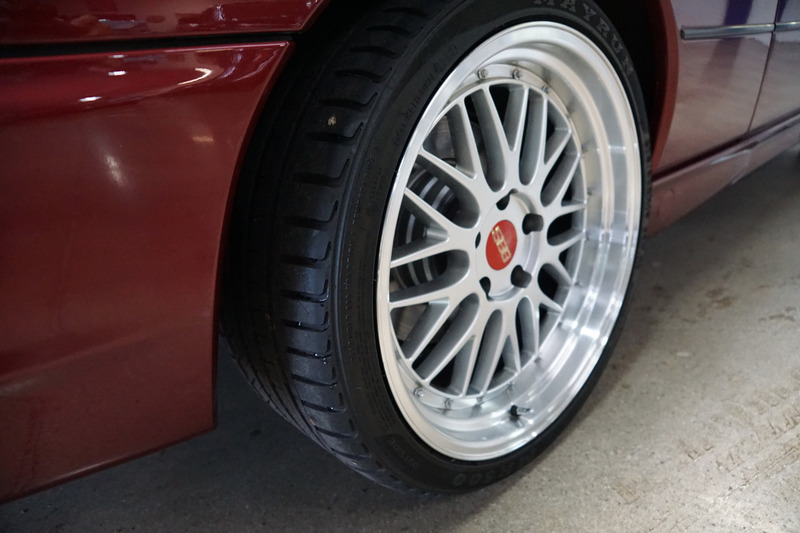 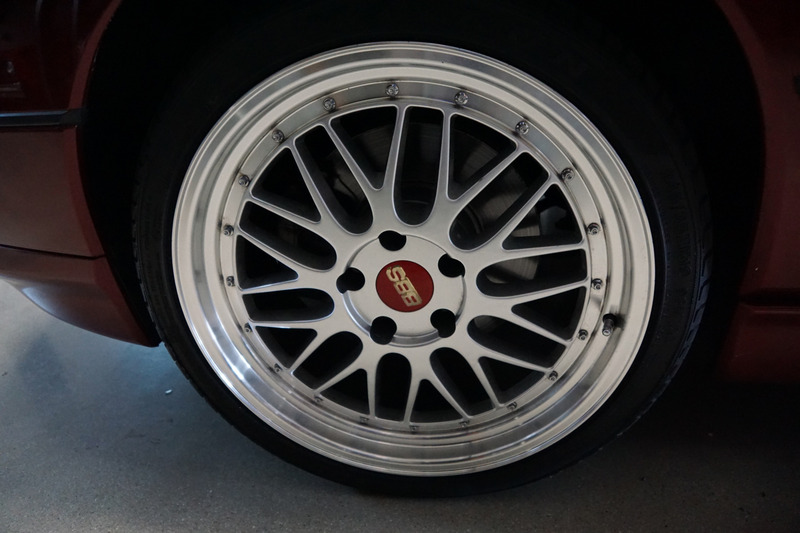 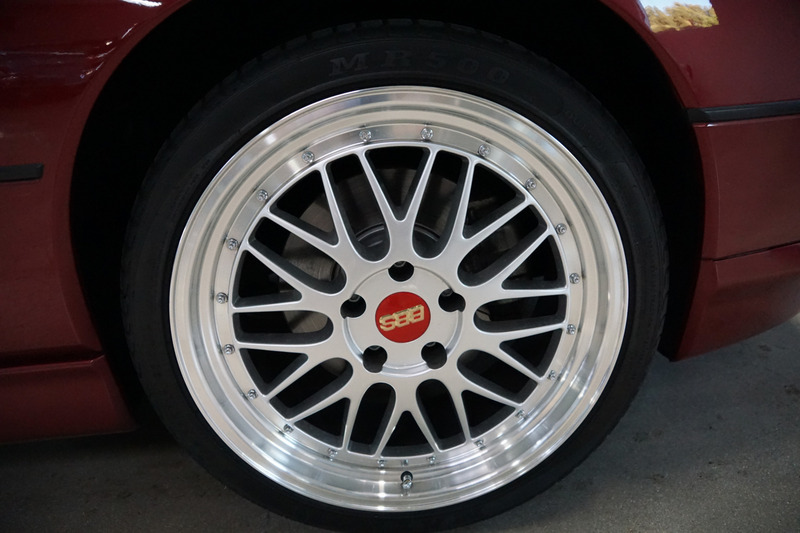 The tires are relatively new and the car boasts its original forged 'BBS' high performance light alloy with BMW cross-spoke styling designer wheels. 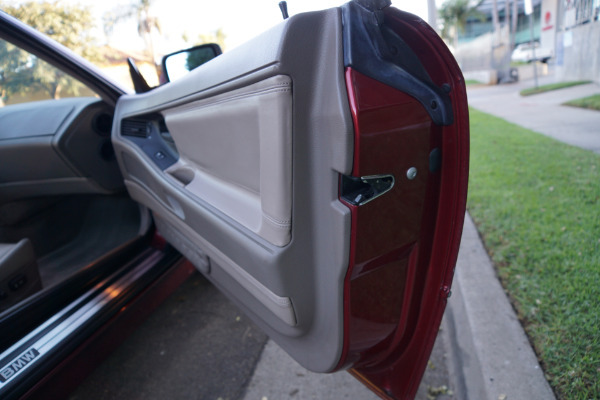 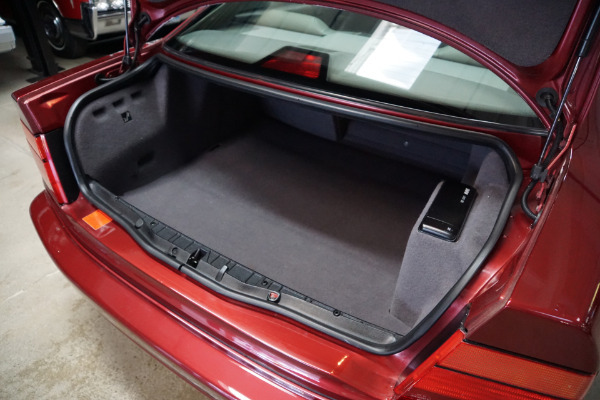 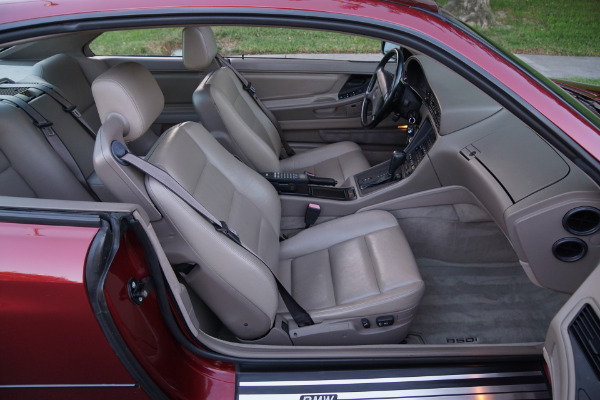 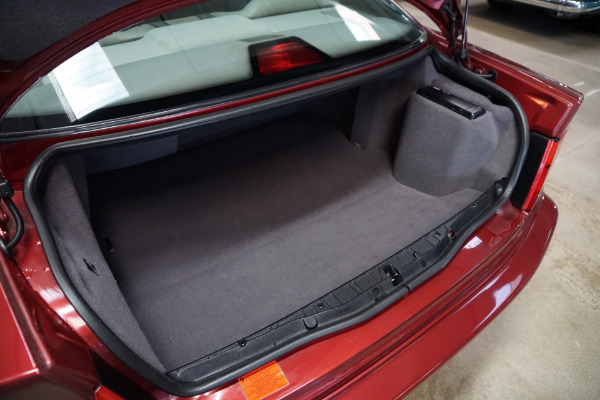 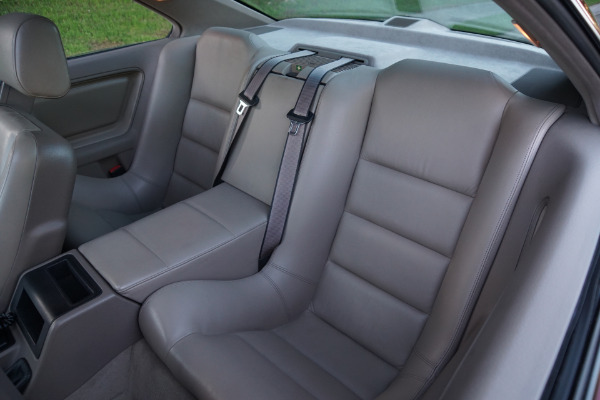 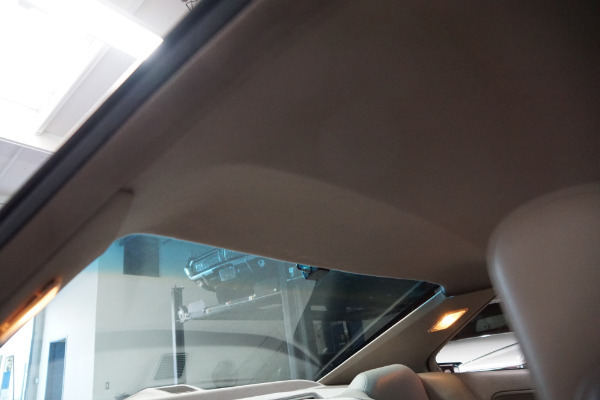 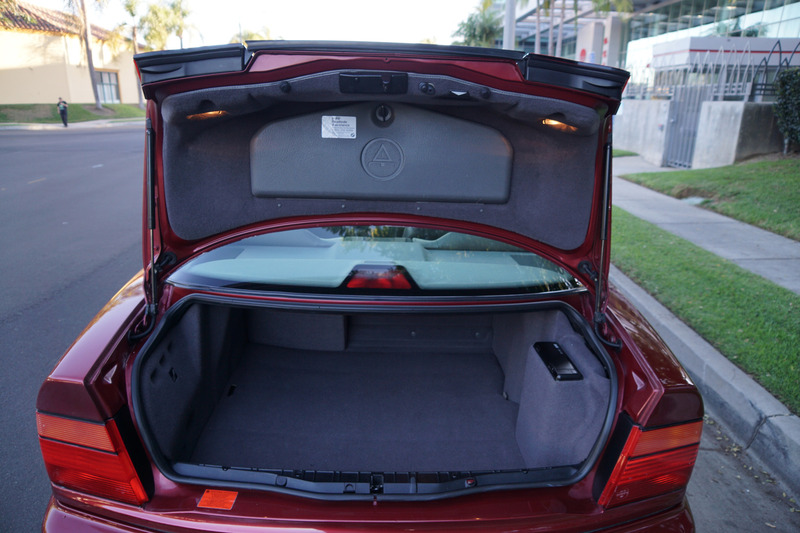 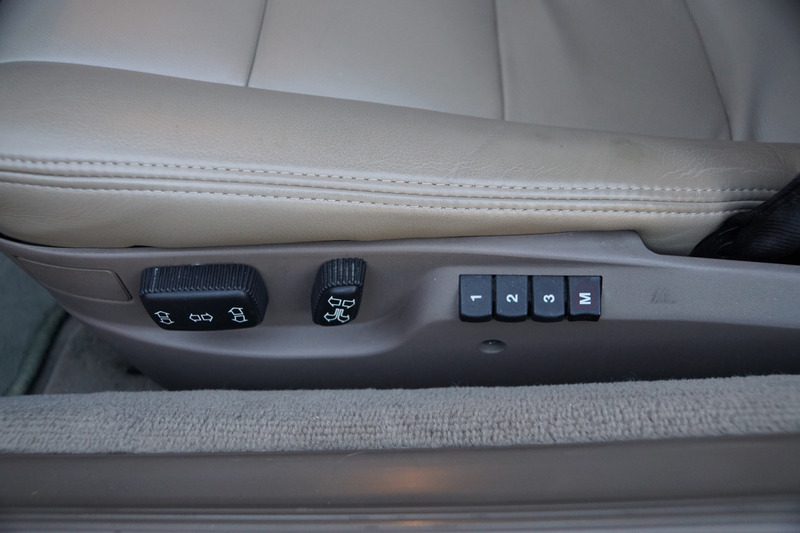 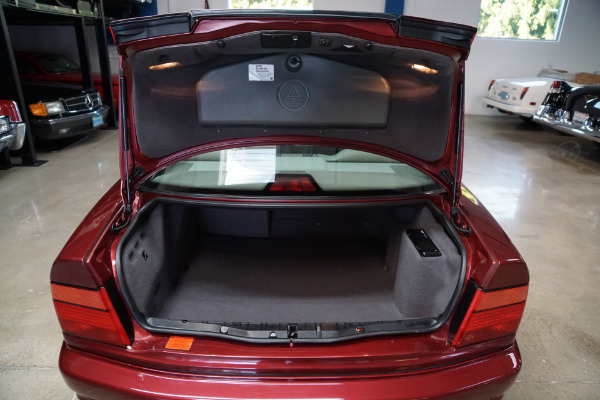 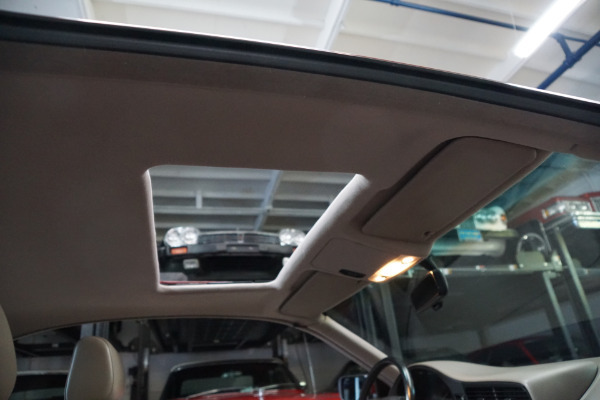 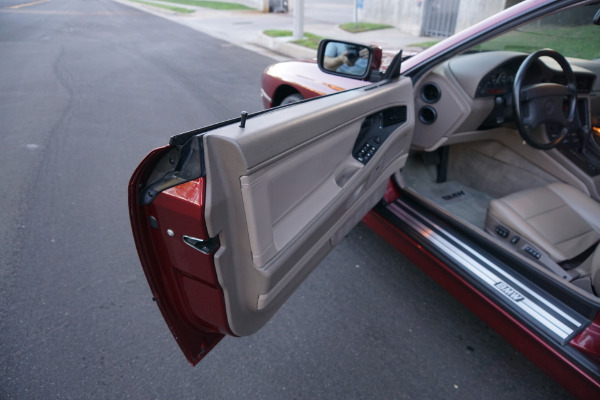 It has front and rear air conditioning, a sunroof, toolkit in the trunk and heated seats. 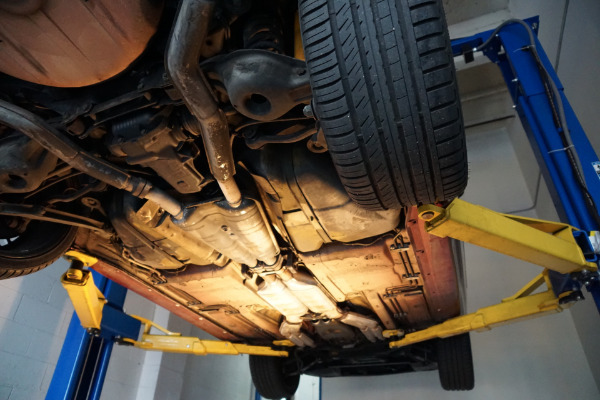 The car drives exactly like such a low mileage and specialist well maintained model should and must be seen and driven to be truly appreciated! 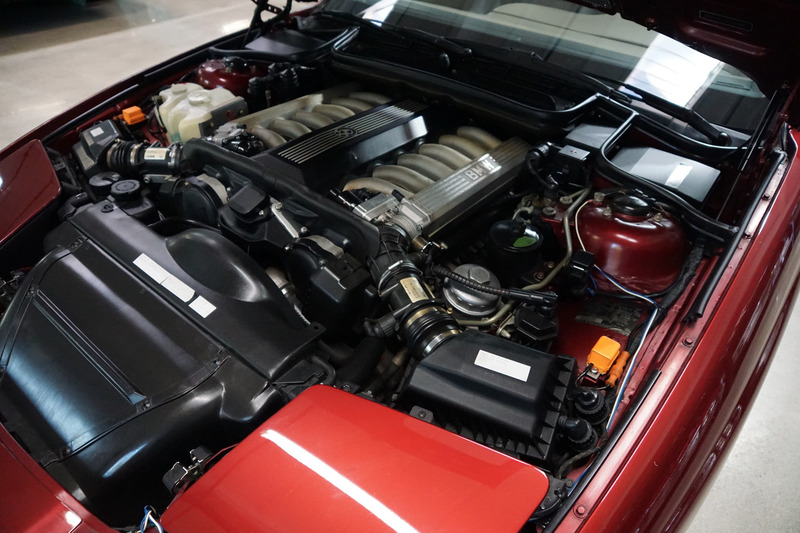 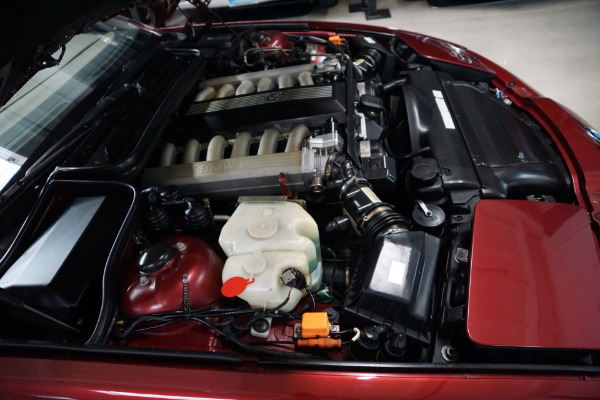 The 5.0 litre V12 engine is extremely strong and powerful and still drives as it must have when it left the showroom floor over twenty years ago, the transmission has a very smooth transmission shift through all gears and the temperature always remains cool! 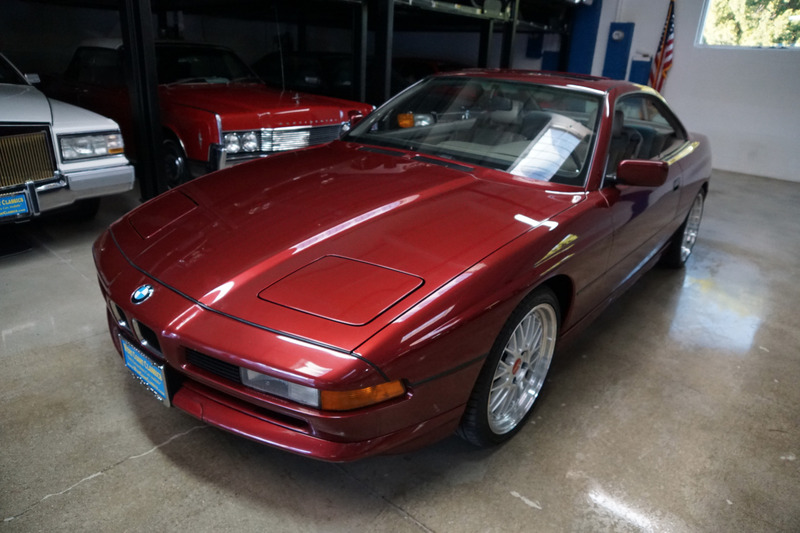 The iconic 8 series, BMW's classic elegant sports coupe, was introduced in 1991 as a shapely and elegant luxury successor to the 635CSi. 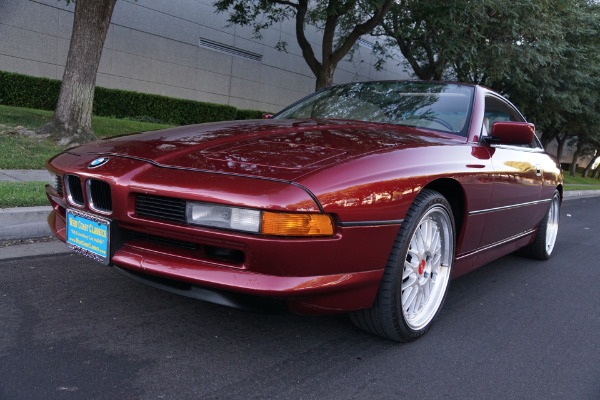 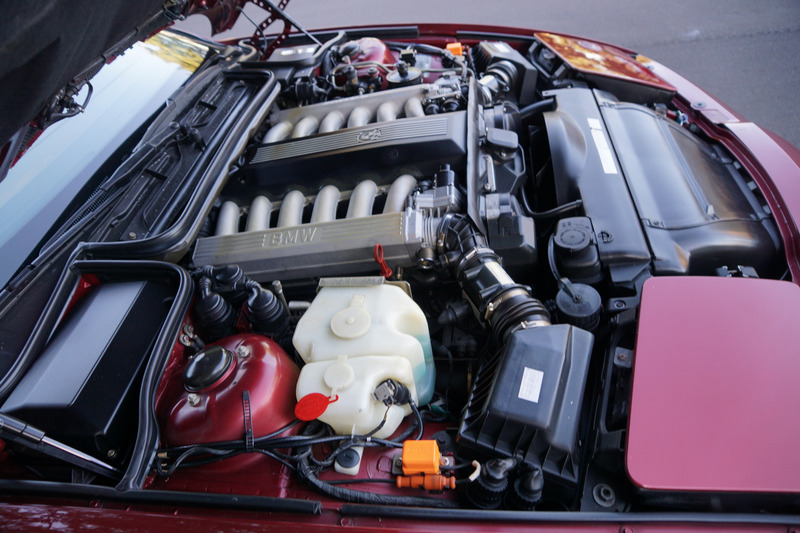 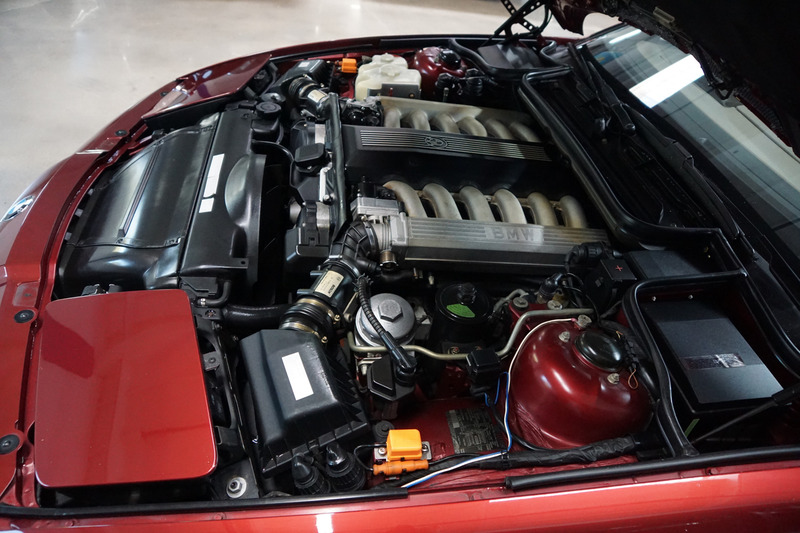 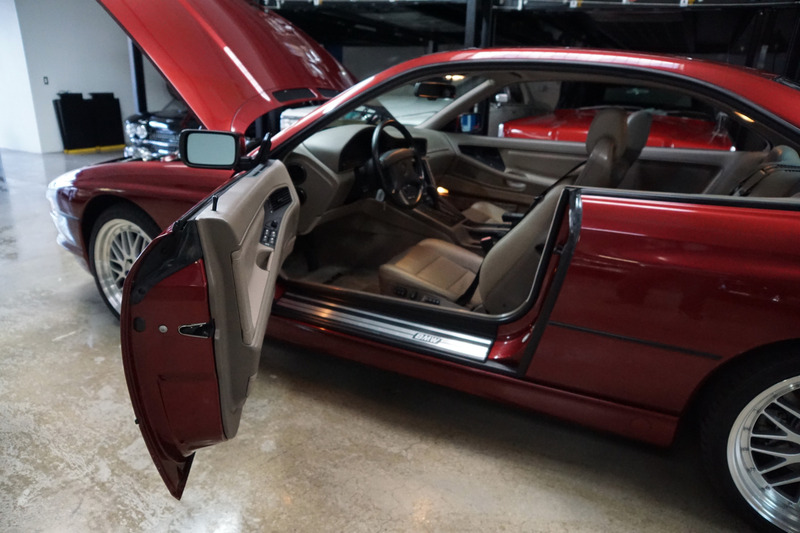 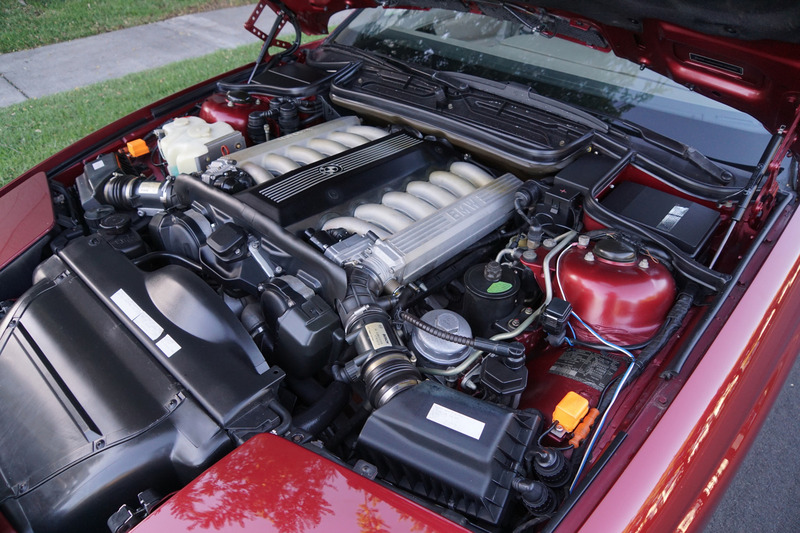 With rear wheel drive in the classic performance car mold, the 8 series offered both performance and luxury with the 5.0L V12 engine pushing 296HP. 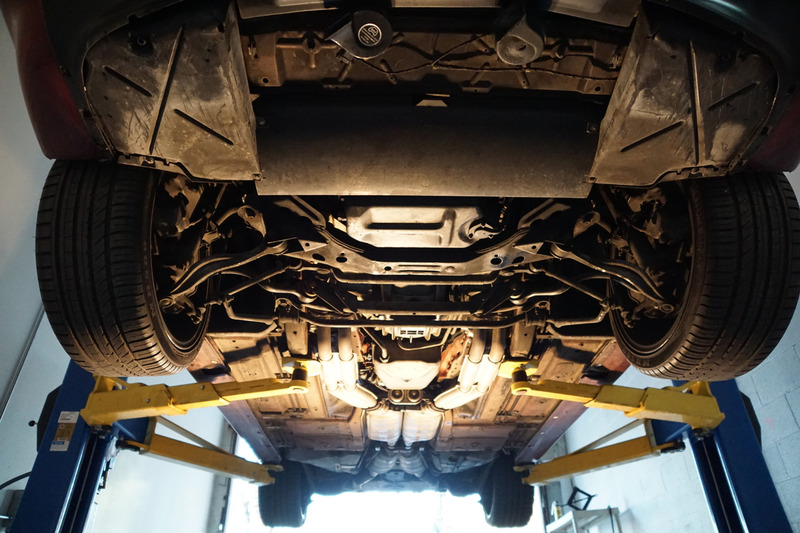 The car's high price of over $75K (over $137K adjusted for inflation in 2018!) 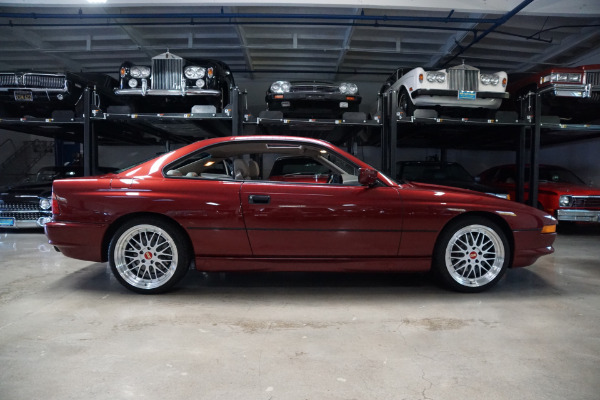 in 1991 was not well received in this recession year and sales never picked up making these cars a bargain today and now proving increasingly desirable amongst BMW enthusiasts. 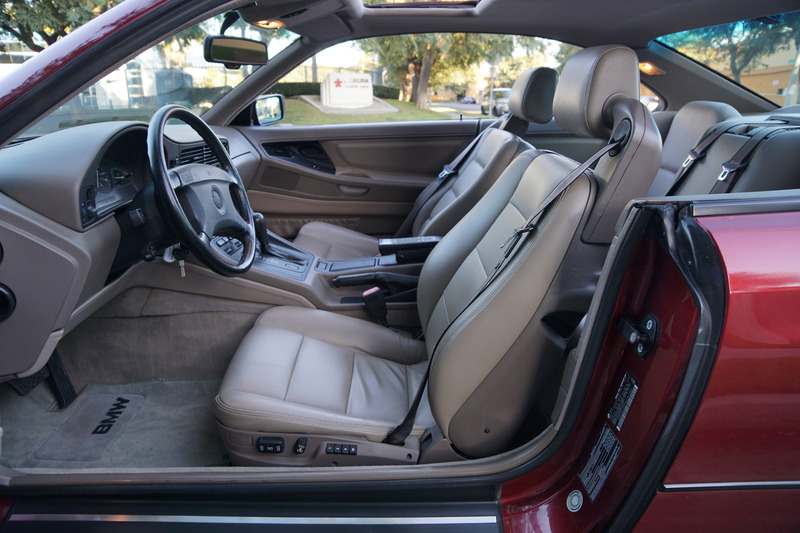 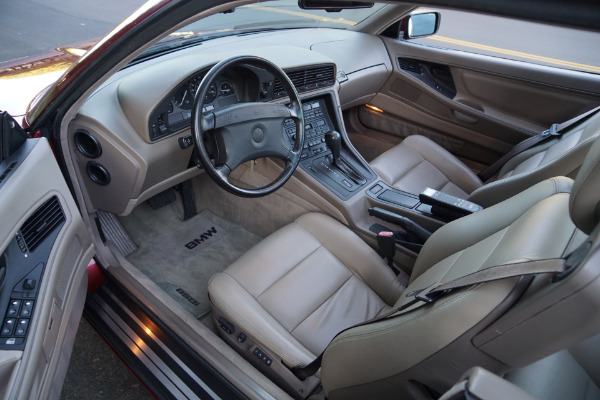 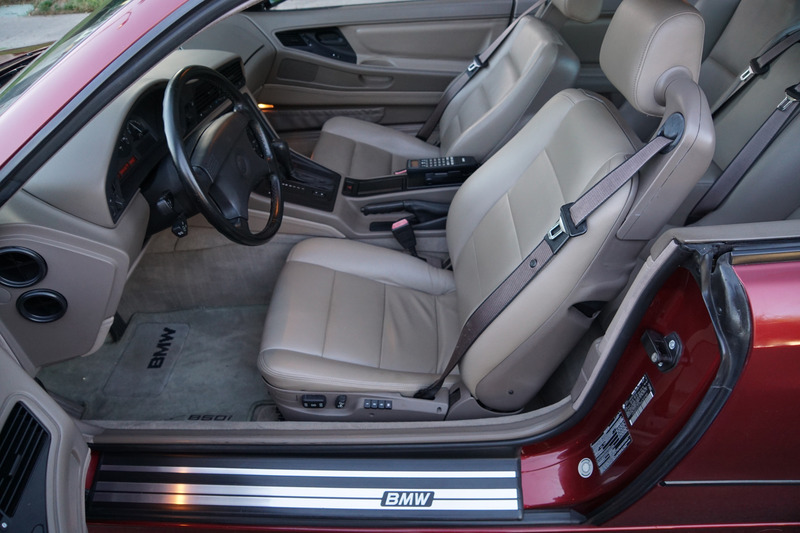 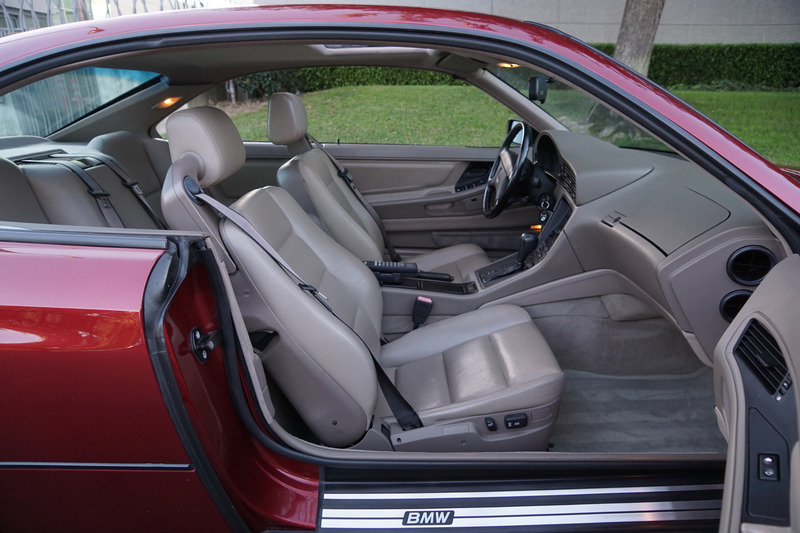 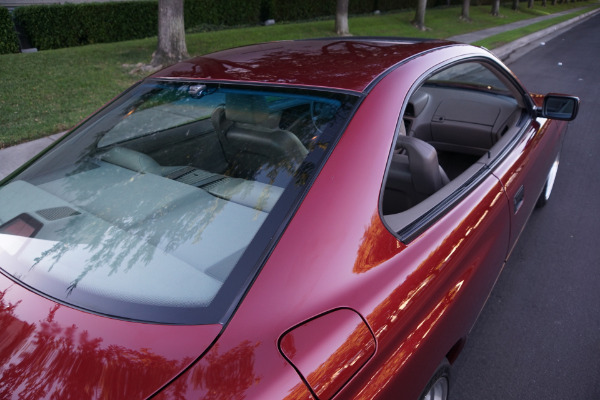 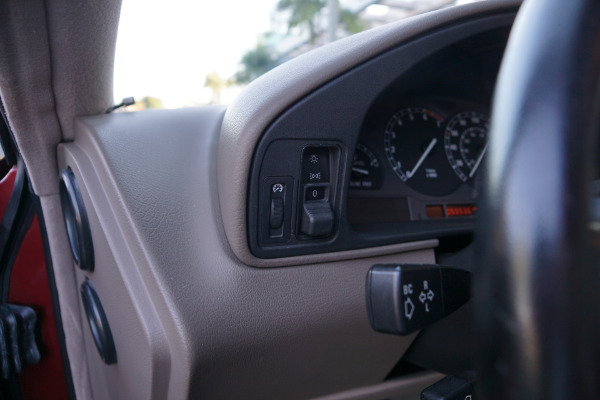 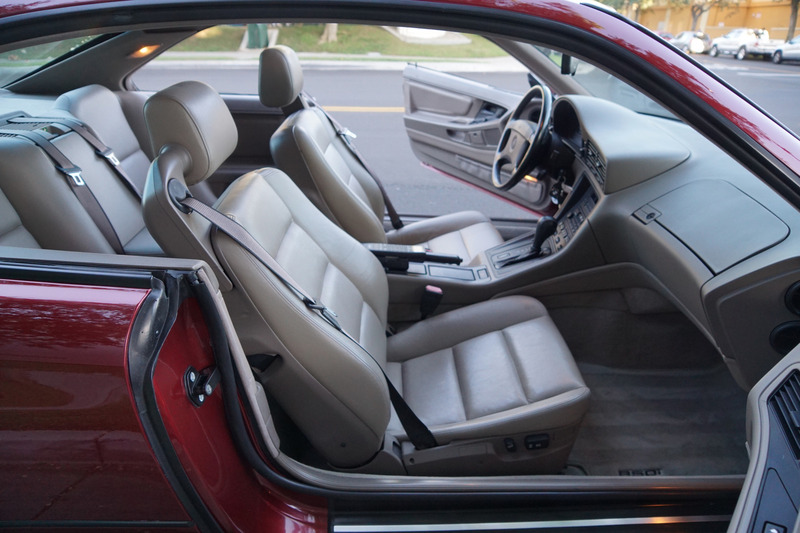 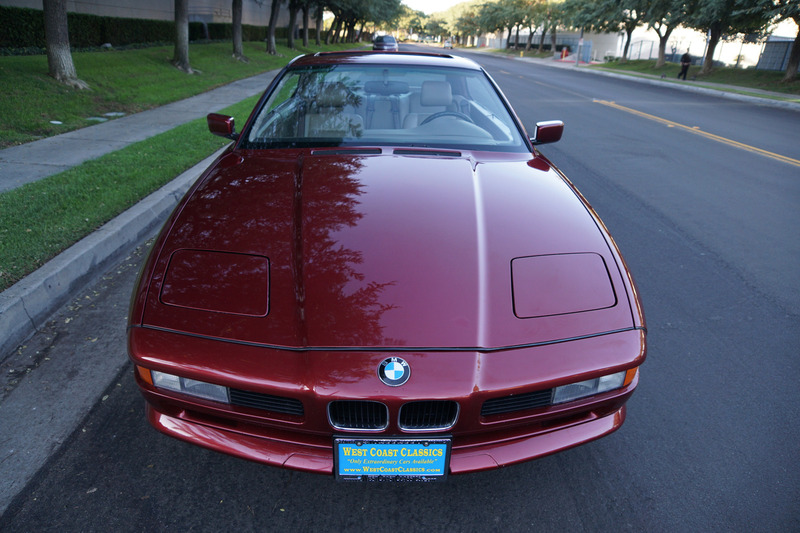 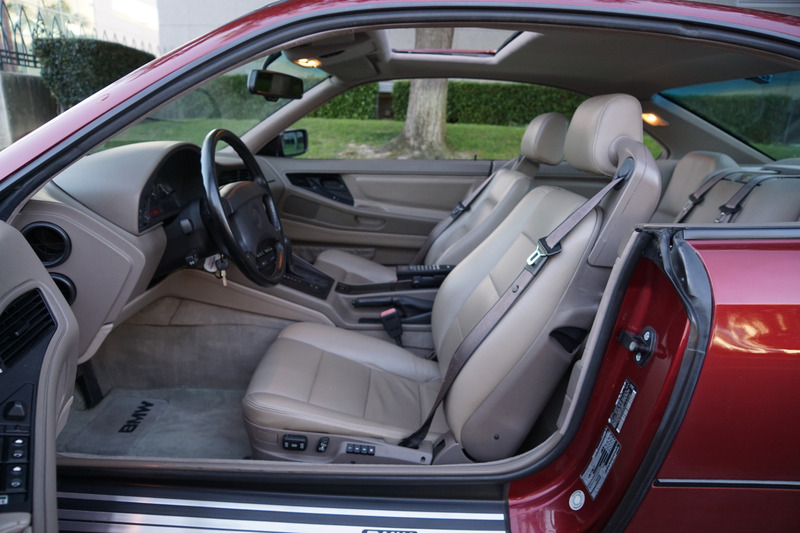 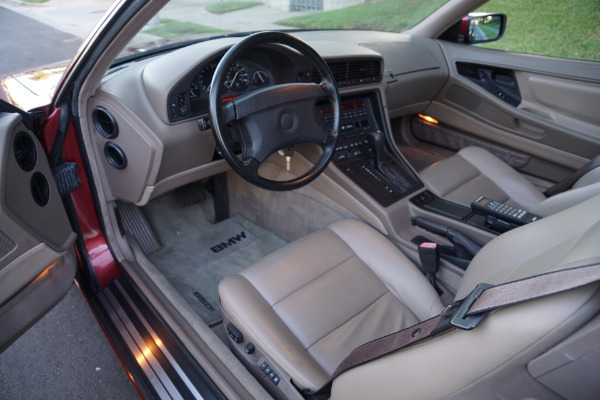 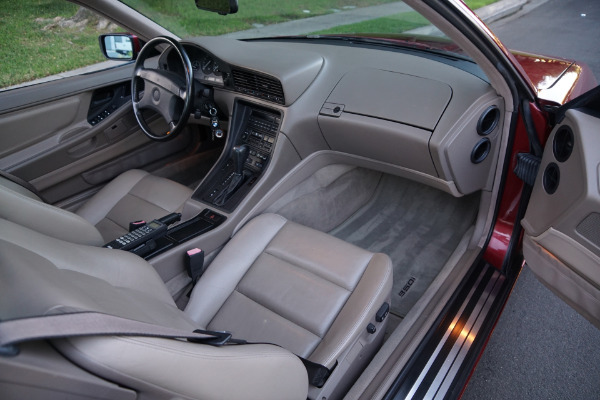 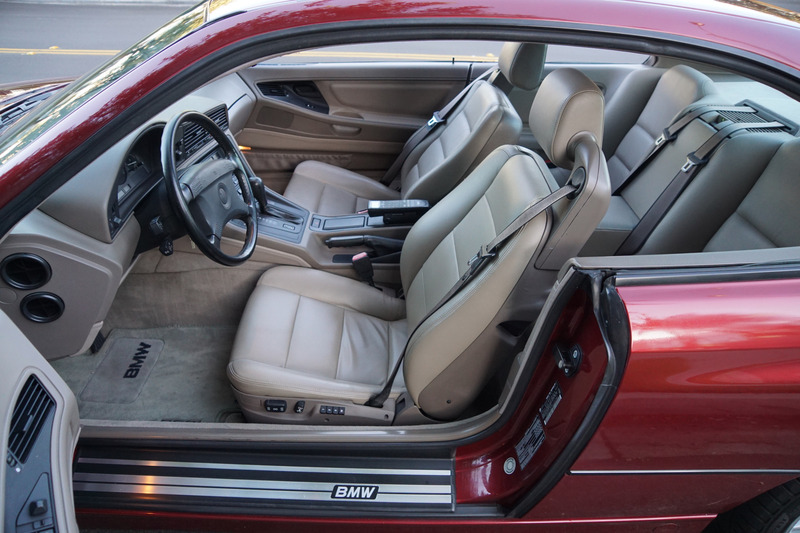 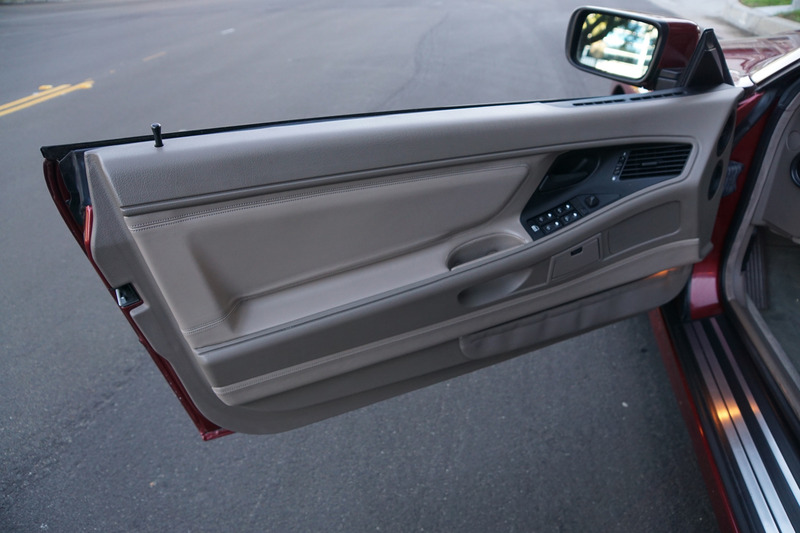 The 850i was a technological showcase, boasting cutting-edge luxury features such as remote keyless entry, dual-zone climate control, a power tilt-and-telescope steering wheel, a twelve-speaker stereo, and windows that automatically closed at high speeds. 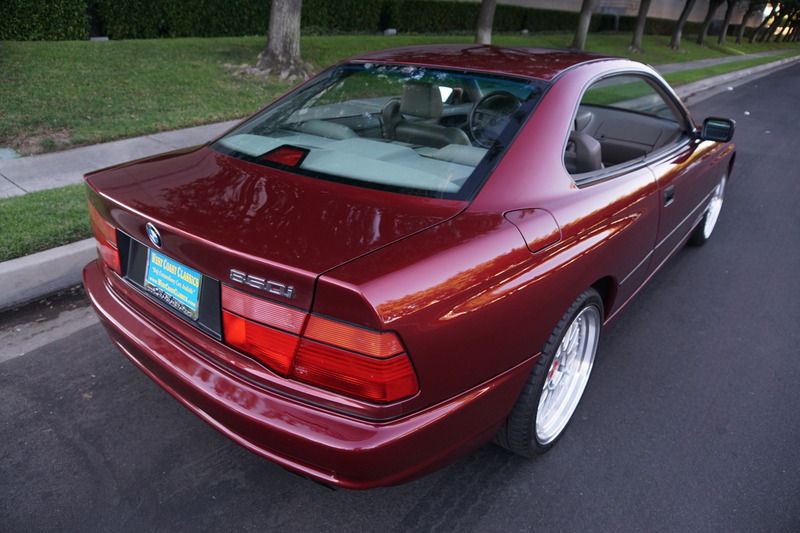 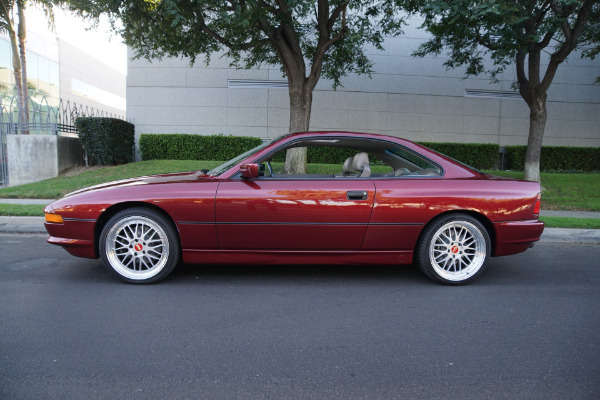 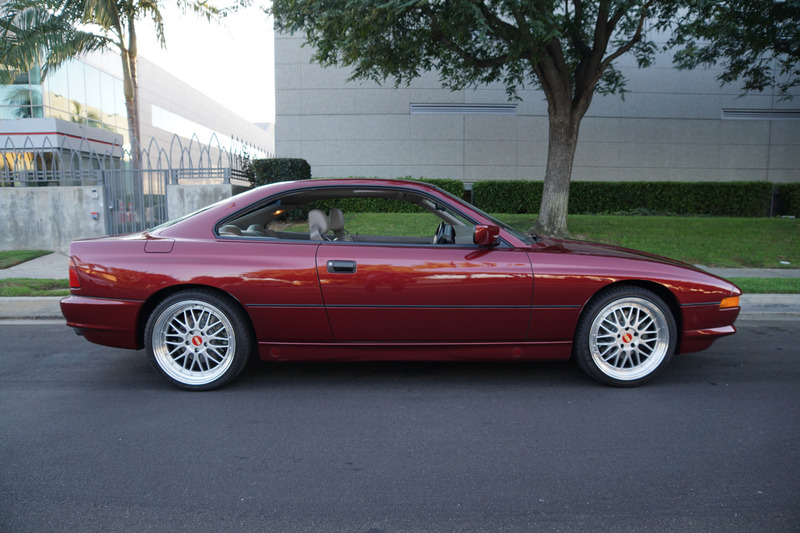 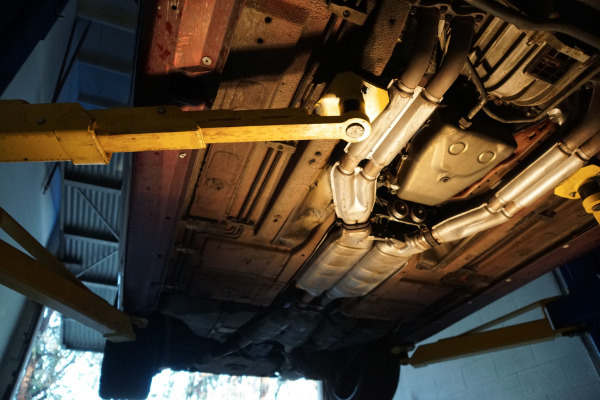 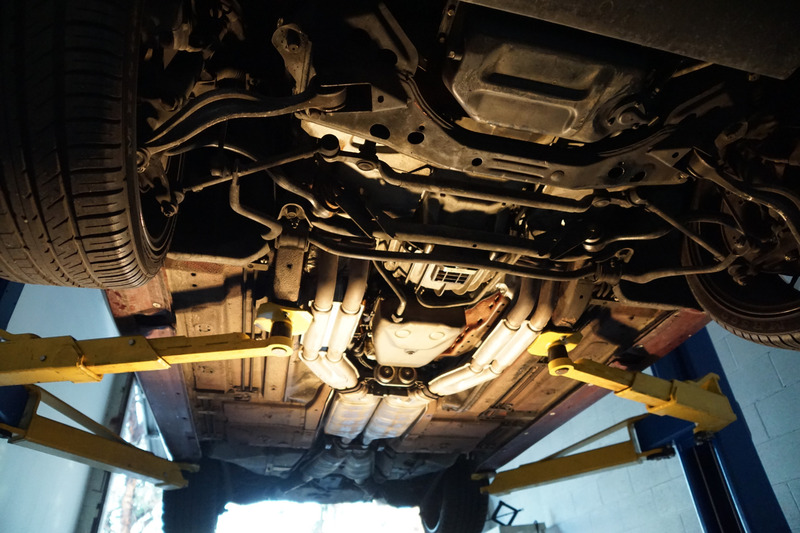 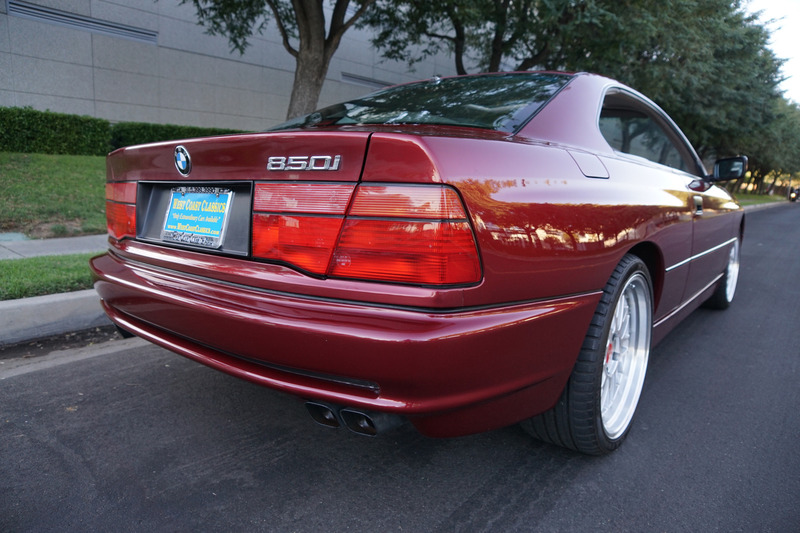 An active five-link rear suspension helped steer the 850i at the limit, and an early form of electronic stability control helped keep the big coupe on course. 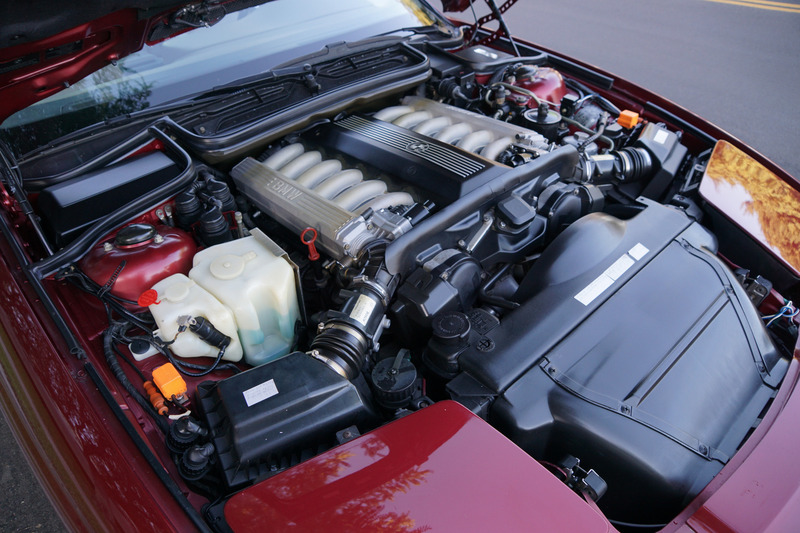 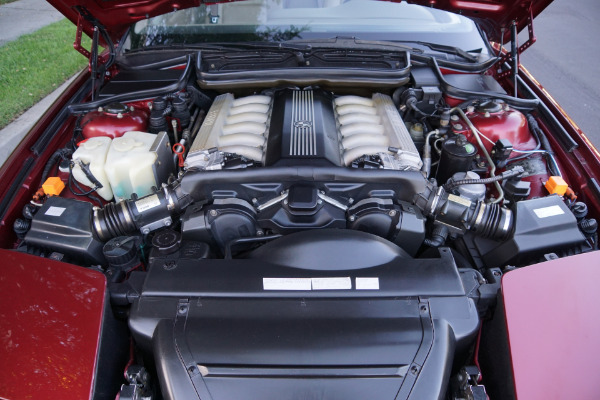 Under the hood the 850i boasted an aluminum-block, 5.0-liter V-12 engine! 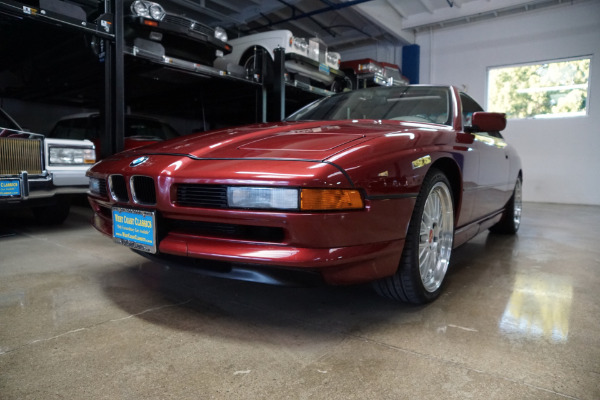 You will surely look long and hard to find a finer example of this exceptionally clean 850i V12 model for the ultimate time warp driving experience with a low and original 55K miles and in this most desirable of color combinations!sly always garaged example of the iconic 850 series, a rare modern day collectible BMW in rare and most desirable all original 'Calypso Red Metallic' color with a light Tan leather interior and only 55K original miles! 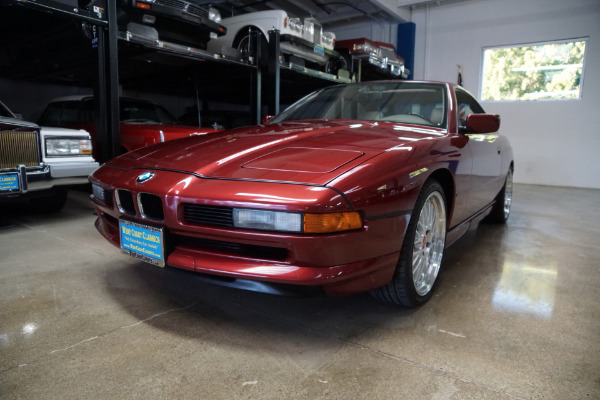 You will surely look long and hard to find a finer example of this exceptionally clean 850i V12 model for the ultimate time warp driving experience with a low and original 55K miles and in this most desirable of color combinations!